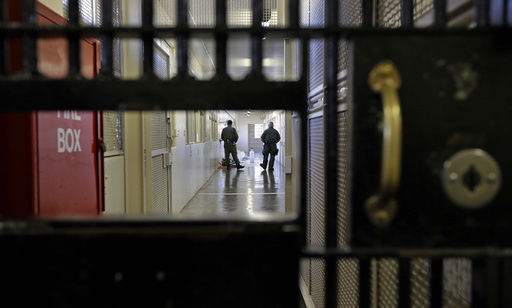 SACRAMENTO, Calif. (AP) — California will no longer keep death row inmates in solitary confinement for years only because of their purported gang affiliations, according to a lawsuit settlement announced Monday. Six San Quentin State Prison inmates sued in 2015, saying they were being held indefinitely under inhumane and degrading conditions in what prison officials call the “adjustment center.” One inmate had been there for 26 years and two others for more than a decade when the lawsuit was filed. About 100 inmates were held when the lawsuit was filed. The number had recently dropped to less than 10, although the corrections department said Monday that it has since increased to 22 inmates. “I think that this settlement provides for a more humane treatment of prisoners who are in that very difficult situation, facing the death penalty,” said Dan Siegel, an Oakland-based attorney who filed the lawsuit. Inmates can still be sent to the windowless cells if they are considered an immediate danger to the prison or others, or if they have at least three infractions within five years for offenses including fighting or possessing drugs or cellphones. The length of their disciplinary sentences can be increased by half if they are gang members. But the maximum length of time in the adjustment center is five years, with a review every six months to see if they can be released. They also can have certain property taken away as punishment for no more than 90 days, according to the settlement obtained by The Associated Press before it was filed in federal court. The adjustment center is one of three units in the nation’s largest death row, which has 749 condemned inmates. The Department of Corrections and Rehabilitation had already changed its policies and none of the plaintiffs are in the center anymore, spokeswoman Vicky Waters said. The lawsuit is patterned after a class-action lawsuit that the state settled in September 2015. California agreed then to end its unlimited isolation of imprisoned gang leaders, a practice that once kept hundreds of inmates in isolation for a decade or longer. “The safety of California prisons in terms of risks to staff and other prisoners has really not been enhanced by keeping people in solitary,” Siegel said. The state will pay inmates’ attorneys $245,000 under the agreement.